There are a lot of foods that lower blood pressure such as citrus fruits, low fat milk, bananas, sweet potatoes, fresh herbs and salmon. There are a lot of foods that lower blood pressure and one effective example is an orange. Citrus fruits are enriched and packed with vitamin C. These fruits when taken as a great part of our diet can effectively reduce the risk of obtaining high blood pressure. The juice form of oranges is loaded with other compounds that can reduce blood pressure. Eating the entire fruit can provide for some extra fiber aside from the vitamin C you can get. Other great sources of vitamin C are guava, tomatoes, strawberries, bell peppers, broccoli and kiwi. Low fat or skim milk is also considered as one of those foods that lower blood pressure. Milk and other dairy products are not only good for your bones but also contain a combination of nutrients that reduce your blood pressure. Nonfat dairy products are those recommended so as to avoid artery clogging saturated fats. Hazelnuts, wheat bran and calcium fortified orange juice are also good sources of calcium, potassium and magnesium. Bananas are also one of those foods that lower blood pressure.If your blood pressure has been rising gradually, a fruit like a banana which is rich in potassium and fiber can help a lot. A diet consisting of potassium rich foods has been proven to lower blood pressure. Other good sources of potassium are potatoes, lentils, tomato paste and apricots. Sweet potatoes are known to be packed with a powerful potassium punch. Potassium allows the kidneys to eliminate excess sodium from our body. The low sodium levels in our body effectively help lower blood pressure. Eating sweet potatoes with their skin also provide for a tasty fiber boost. Beet greens, white beans and plain nonfat yogurt are also good sources of potassium. Fresh herbs are used to spice up our dishes and are good replacements for salt. Dried herbs and spices are naturally sodium free and can really help in lowering blood pressure. Fresh herbs are good but you can also try herbs in a tube such as those from Gourmet Garden. Other flavoring sources that may lower blood pressure are onions, garlic, lemon juice and balsamic vinegar. Salmon is good for lowering blood pressure. 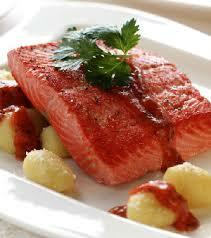 Salmon is one of the few foods that have a lot of heart healthy benefits due to its richness in omega-3 fatty acids. Omega-3 fatty acids not only lower blood pressure but also boost good cholesterol, slow down growth of arterial plaque and reduce triglycerides. Eating a 3.5 ounce of salmon servings per week is recommended by health authorities for a truly healthy heart and lower blood pressure. Pouched or canned salmon is just as good and are very convenient for those who don’t want to cook. Other sources of omega-3 fatty acids are mackerel, herring, sardines and anchovies.